TULSA, Okla. (January 28, 2019) — Adding dates with the Lucas Oil American Sprint Car Series National Tour as well as the ASCS Elite Non-Wing Series presented by Abilene Powder Coating, the new Monarch Motor Speedway in Iowa Park, Texas will see three rounds of action under the ASCS banner in 2019. A special event track in 2019, the track formally known as Wichita Speedway was recently purchased by CRE Promotions. Owner Charles Raymond Evans III also heads the Deep South Ultimate Super Late Model Series. Starting with the ASCS Elite Non-Wing Series presented by Abilene Powder Coating, the newly added traditional Sprint Car series will visit the three-eighths mile oval on Friday, April 19 and Saturday, April 20. “I love Non-Wing Sprints and wanted to give those guys a big show and make it an annual event that can just get bigger,” commented track owner, Charles Raymond Evans III of the two-day Elite ASCS Non-Wing show. Dubbed the ASCS Non-Wing Nationals, Friday’s preliminary event will be $1,000 to win, $200 to start with Saturday’s finale upping the payout to $5,000 to win, $300 with an additional $1,000 bonus to sweep the weekend. For the Lucas Oil American Sprint Car Series National Tour, the series will kick off the 2019 ASCS Sizzlin’ Summer Speedweek “Where Racing Royalty Gets Its Crown” on Friday, May 31. A $4,000 to win, $400 to start showdown, the event pairs with Route 66 Motor Speedway in Amarillo, Texas which takes place on Saturday, June 1. Information on CRE Promotions can be found online at http://www.facebook.com/crepromotionsllc. A website for the track is in the works and will be live in the coming weeks. Mr. Evans can be reached by cell at (256) 684-5623. The ASCS Elite Non-Wing Series presented by Abilene Powder Coating is headed by Nathan Moore. The Non-Wing Tour’s first year under the ASCS banner, any scheduling or rules questions can be addressed with Nathan by calling (903) 780-9934. Scheduling questions about the Lucas Oil American Sprint Car Series National Tour can be addressed to Terry Mattox at (918) 838-3777. Rules can be clarified with National Director, Matt Ward. 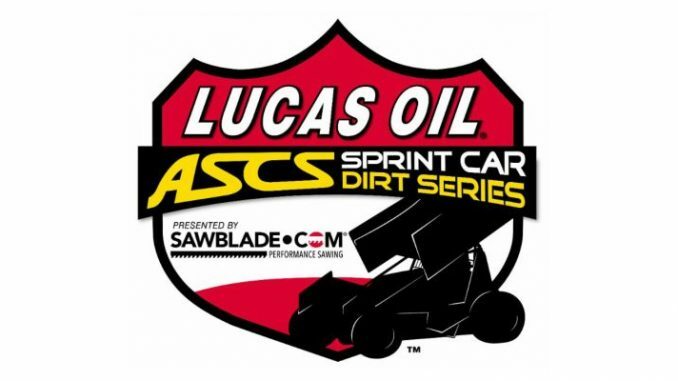 For other news, notes, and information on the American Sprint Car Series, from the National Tour to any of the Regional Tours that make up ASCS Nation, log onto http://www.ascsracing.com, follow on Facebook, on Instagram, and on Twitter (@LucasOilASCS).